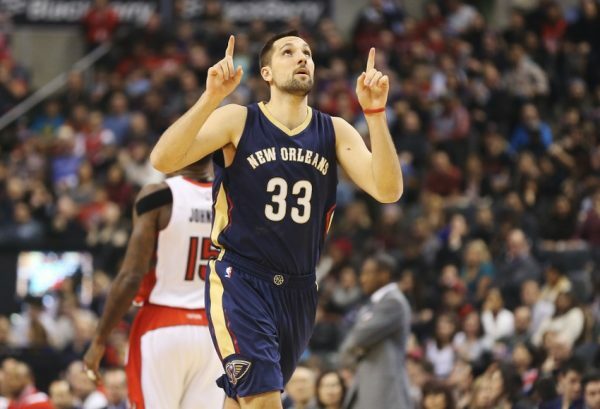 After four seasons with the New Orleans Pelicans, it looks like Ryan Anderson will find himself a new team in free agency, with the Houston Rockets, Sacramento Kings and Washington Wizards interested in signing him. Anderson, 28, has played more than 66 games in a season just once in his career. However, the skill set he brings to the table is perfect for the trend in the NBA of big men (6’10) who can stretch the floor. Anderson averaged 17 points per game last season for the often-injured Pelicans, shooting 36.6% from beyond the arc while playing 30.4 minutes per game. He signed a $34 million, four-year deal when he joined the Pelicans (then the Hornets). He is expecting to sign a deal worth almost twice that, with the rising salary cap. However, he’ll wait for Kevin Durant to sign first, and then see what’s left once the dust settles. A team that seems like a natural fit are the Houston Rockets, who have been trying to figure out their ‘4’ situation for a number of seasons. There are a number of things the Rockets need to figure out in free agency, but if Mike D’Antoni will get his way, players like Anderson could fit perfectly in his system, even as centers. He has done some work at the ‘5’ before the last two seasons, and if the Rockets can pair him up with a good rim protector and rebounder in the frontcourt, Anderson could be very useful with his particular set of skills, especially in the D’Antoni system. The Rockets will face fierce competition from the Washington Wizards, who tried trading for Anderson during the 2015-2016 season, but couldn’t give the Pelicans the first round pick they were looking for. They did give it up for Markieff Morris. They still missed the playoffs. The Wizards are desperate for a shooter, a veteran one, and Anderson fits the bill. The Wizards have around $40 million in cap space. Signing Anderson to the kind of deal he’s looking for ($15-17 million a season) won’t stop them from adding a few more meaningful pieces, while going after Bradley Beal, a restricted free agent, so he doesn’t get away. The Kings have needs all over the place, but it’s never easy actually predicting what their thought process is. A team that has created mismatches within the team time and time again might get it right, but even if they do add Anderson, who could take up minutes from someone like Omri Casspi while giving the Kings another player who is all about offense and nothing much else, the fit seems a bit weird considering they’re not quite sure where they’re going and what they’re doing. Winging it isn’t always bad, but the Kings have been terrible at it for years. Signing Anderson, for them, doesn’t sound like a move that upgrades them significantly.